Native American Facts For Kids was written for young people learning about the Algonquins for school or home-schooling reports. We encourage students and teachers to visit our main Algonquin website for in-depth information about the tribe, but here are our answers to the questions we are most often asked by children, with Algonquin pictures and links we believe are suitable for all ages. Photographs are the property of the sources we have credited. How do you pronounce "Algonquin?" How do you spell it? Algonquin is pronounced Al-GON-kin. "Algonquin" is the most common spelling, but you'll often see "Algonkin" too. Either way is fine--but avoid spelling the word "Algonquian" or "Algonkian," because that refers to a whole group of Native American languages (including Cree, Blackfoot, and Delaware)! The Algonquins are only one of the many Algonquian-speaking tribes, and they have a unique identity and independent political status from the others. What does the word "Algonquin" mean? "Algonquin" was the French name for the tribe. The French were probably trying to pronounce elehgumoqik, the Maliseet word for "our allies," or Algoomaking, a Mi'kmaq place name. The Algonquins call themselves Anishnabe, which means "original person." (The plural is Anishnabek.) However, Algonquins use Anishnabek to refer to other Indians also. So when they are specifically referring to their tribe, they usually use "Algonquins" or "Algonkins" to distinguish themselves. Where do the Algonquins live? The Algonquins are original natives of southern Quebec and eastern Ontario, in Canada. Today they live in nine communities in Quebec and one in Ontario. Here is a map showing the location of the Algonquin and their relatives. No. Other Algonquian tribes lived in New York, but never the Algonquin tribe. This is a mistake that happened because of the similar spellings of these words. Algonquian tribes that lived in New York included the Mahican and Wappinger tribes, the Montauk and Shinnecock tribes, and the Munsee Delaware tribe. You can visit this map of New York Indian tribes to see where in New York each of those tribes lived. How is the Algonquin Indian nation organized? Do they live on reservations? Algonquin band flags Each Algonquin community lives on its own reserve, also known as a reservation. Reserves are land that belongs to the tribe and is legally under their control. Each Algonquin tribe--known as a band or First Nation in Canada--is politically independent and has its own leadership. Algonquin First Nations have their own government, laws, police, and services, just like small countries. However, the Algonquins are also Canadian citizens and must obey Canadian law. The leader of each Algonquin band is called ogima or ogema, which is translated as "chief" in English. The ogima used to be chosen by tribal councilmembers, often from the last chief's sons, nephews, or sons-in-law. Today chiefs are elected by the Algonquins, just like governors or mayors. What language do the Algonquin people speak? Some bands are English-speaking, and others are French-speaking. About half the Algonquin population also speak their native Algonquin language. Algonquin is a musical language that has complicated verbs with many parts. If you'd like to learn a few easy Algonquin words, "kwey" (rhymes with "day") is a friendly greeting and "meegwetch" means "thank you." You can listen to an Algonquin woman talk in her language here and see an Algonquin picture glossary here. What was Algonquin culture like in ancient times? What is it like now? Here's a link to the Algonquin Nation Tribal Council homepage. There you can find information about three Algonquin communities in the past and today. How do Algonquin Indian children live, and what did they do in the past? Algonquin doll They do the same things all children do--play with each other, go to school and help around the house. Many Algonquin children like to go hunting and fishing with their fathers. In the past, Indian kids had more chores and less time to play, like early colonial children. But they did have toys, games and dolls, like this 18th-century doll in its miniature cradleboard. Algonquin mothers, like many Native Americans, carried their babies in cradleboards on their backs--a custom which many American parents have adopted now. What were Algonquin men and women's roles? Algonquin women gathered plants to eat and did most of the child care and cooking. Men were hunters and sometimes went to war to protect their families. Both genders took part in storytelling, artwork and music, and traditional medicine. In the past, the Algonquin Indian chief was always a man, but today a woman can be chief too. What were Algonquin homes like in the past? Wigwam in Ontario The Algonquins didn't live in tepees. For most of the year they lived in settled villages of birchbark houses, called waginogans or wigwams. Algonquin wigwams were usually dome-shaped and not very large-- only a single family unit lived in each one. In some Algonquin communities, multiple families from the same clan would live together in a much larger birchbark longhouse, like their Iroquois neighbors. During the winter, the village split up to go to hunting camps, and each Algonquin family would build a cone-shaped shelter like this for their camp. These shelters were temporary and were discarded whenever the family needed to move. At the end of winter, they would move back to their permanent lodges in their village. Here are some more pictures of American Indian houses like the ones the Algonquins used. Today, Native Americans only build a birchbark lodge for fun or to connect with their heritage. Most Algonquin people live in modern houses and apartment buildings, just like you. What was Algonquin clothing like? Did they wear feather headdresses and face paint? Moccasin Algonquin women wore long dresses with removable sleeves and the men wore breechcloths and leggings. Both genders wore moccasins on their feet and cloaks in bad weather. 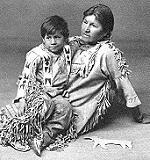 Later, the Algonquins adapted European costume such as cloth blouses and jackets, decorating them with fancy beadwork. The Ojibway chief to the left is wearing the same style of clothing Algonquin men did. Here are more pictures of Ojibway and Algonquin clothing styles, and some photos and links about Native American clothing in general. Some Algonquin warriors shaved their heads in the Mohawk style, using grease to stiffen their hair so that it spiked up. Otherwise, Algonquin men and women both wore their hair in long braids. Some men wore a porcupine roach with a feather in it. (These roaches are made of porcupine hair, not the sharp quills!) In the 1800's, some Algonquin chiefs began wearing a feathered headdress like their neighbors the Sioux. The Algonquins painted their faces and arms with bright colors. They used different patterns for war paint and festive decoration. Some Algonquin men also wore elaborate tribal tattoos. Today, some Algonquin people still wear moccasins or a beaded shirt, but they wear modern clothes like jeans instead of breechcloths... and they only wear feathers in their hair on special occasions like a dance. What was Algonquin transportation like in the days before cars? Did they paddle canoes? Algonquin canoe Yes--the Algonquin Indian tribe was famous for their birchbark canoes. Here is a website with pictures of Native American canoes. Canoeing is still popular in the Algonquin nation today. Over land, the Algonquins used dogs as pack animals. (There were no horses in North America until colonists brought them over from Europe.) The Algonquins used sleds and snowshoes to help them travel in the winter. Today, of course, Algonquin people also use cars... and non-native people also use canoes. Algonquin deer hunt What was Algonquin food like in the days before supermarkets? The Algonquins were hunting people. They hunted for deer, moose, and small game, and went fishing in the rivers and lakes. Some Algonquin communities grew corn and squash in small gardens, but most Algonquins only got foods like those in trade with neighboring tribes. Besides fish and meat, the Algonquins gathered berries and wild plants to eat. They also made maple syrup from tree sap. Here is a website with more information about Native American food. What were Algonquin weapons and tools like in the past? Algonquin Indians used bows and arrows or spears for hunting. 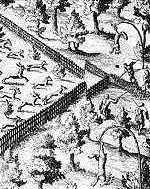 Algonquin hunters also built traps like the ones in this picture to catch deer and other game animals. Algonquin fishermen used pronged spears to stab fish from their canoes or through holes in the ice, instead of fishing with hooks. Algonquin warriors fought each other with war clubs, spears, or tomahawks. Here is a picture of an Anishinabe war club, and a website with pictures and more information about Native American weapons in general. What are Algonquin arts and crafts like? Algonquin basket Algonquin artists are known for their beadwork and basketry arts. Like other eastern American Indians, Algonquins also crafted wampum out of white and purple shell beads. Wampum beads were traded as a kind of currency, but they were more culturally important as an art material. The designs and pictures on wampum belts often told a story or represented a person's family. Today, Algonquin people also create contemporary art like oil paintings. You can visit this site to see photographs of Algonquin paintings. What other Native Americans did the Algonquin tribe interact with? The Algonquins are related to the Ojibway and Ottawa tribes, who have usually been their allies. They were also friends with the Hurons. The Algonquins often fought with the Iroquois tribes, but when they weren't at war with them, they were trading partners. The Algonquins traded beaver pelts and other furs for Iroquois corn and tobacco from the south. What kinds of stories do the Algonquins tell? There are lots of traditional Algonquin legends and fairy tales. Storytelling is very important to the Algonquin Indian culture. Here is one Algonquin legend about the sunset. Here's a website where you can read more about Algonquin mythology. Who are some famous Algonquin Indians? Hockey star Gino Odjick is Algonquin from Kitigan Zibi. Here's a biography of him. Odjick is also active in trying to combat alcohol abuse among First Nations youth. Here is an article about that. Religious traditions are too complicated and culturally sensitive to describe appropriately in only a few simple sentences, and we strongly want to avoid misleading anybody. 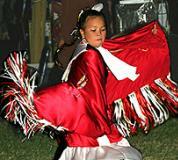 You can visit this site to learn more about Algonquin beliefs or this site about Native American religions in general. It's hard to find a good book on the Algonquins because people get so confused about their name. The Last Algonquin is a good book, but it is actually about a Wecquaesgeek (Wappinger) man, not an Algonquin. Kipawa: Portrait of a People gives you a good look at an actual Algonkin nation, but it is out of print and hard to find. The Algonquins is a good collection of essays with interesting information about the Algonquin people past and present, but it could be hard for younger kids to read. Two simple books with information about the Algonquin tribe are The Algonquin and Algonquin Native Americans. You can also browse through our reading list of good Native American books in general. Thanks for your interest in the Algonquin Indian people and their language! An overview of the Algonquin people, their language and history. Algonkin language samples, articles, and indexed links. Related links about the Algonquin people past and present.